Twenty-two people were arrested in recent weeks as part of a drug sweep. 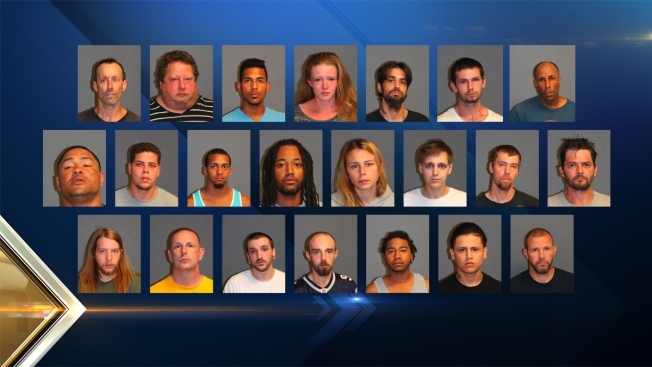 Twenty-two people were arrested in recent weeks as part of a drug sweep by police in Nashua, New Hampshire. Kevin Cole, 47, of 27 Trout Brook Dr., Nashua, for heroin possession. Joseph Crowley, 49, of 5 Epping St., Nashua, for unlawful sale of cocaine, second offense. Phillip De Los Angeles, 26, of 10 Badger St., Nashua, for three counts of unlawful sale of marijuana. Nicole Denman, 25, of 36 Gillis St., Nashua, for possession of heroin. Jesus Figueroa, 40, of 80 Chestnut St. #4, Nashua, for unlawful sale of cocaine, second offense and unlawful sale of crack cocaine, second offense. Ferdinand Gracia, 26, no fixed address, for three counts of unlawful sale of heroin, second offense. Luis Jiminian, 22, of 174 Arlington St., Lawrence, Massachusetts, for possession of marijuana and possession of oxycodone hydrochloride. Nasah Johnson, 27, of 225A Noble St., Souderton, Pennsylvania, for unlawful sale of crack cocaine, possession of crack cocaine with intent to distribute, possession of crack cocaine, five counts of criminal liability to unlawful sale of crack cocaine, possession of marijuana and possession of MDMA with intent to distribute. Kevin Johnston, 23, of 5 Cranston Circle, Merrimack, for two counts of unlawful sale of heroin. James Karos, 48, of 50 Anvil Dr., Nashua, for four counts of unlawful sale of heroin, second offense, possession of heroin with intent to distribute, second offense, possession of Methadone, second offense and possession of Suboxone, second offense. Anthony Kennedy, 22, of 114 Amherst St. #9, Nashua, for three counts of unlawful sale of marijuana. Andrew Lavoie, 28, of 11 Willow Lane, Amherst, for three counts of unlawful sale of heroin, second offense. Brian Levesque, 43, no fixed address, for two counts of unlawful sale of heroin and criminal liability to unlawful sale of heroin. Andre McKinney, 24, of 18 Library St., Burlington, New Jersey, for four counts of unlawful sale of crack cocaine, unlawful sale of MDMA, possession of crack cocaine with intent to distribute and possession of marijuana. Kevin Munoz, 21, of 210 Pine St. #12, Nashua, for three counts of unlawful sale of heroin and possession of marijuana. Paul Overacker, 39, of 9 Ash Court, Nashua, for unlawful sale of crack cocaine, second offense and two counts of unlawful sale of cocaine, second offense. Peter Panetti, 35, no fixed address, for possession of heroin. Melissa Quigley, 27, of 138 Charles Bancroft Highway, Litchfield, for four counts of unlawful sale of heroin, second offense. Robert Reidy, 23, of 12 Grand Ave., Nashua, for acts prohibited and two counts of possession of heroin. Aaron Sherman, 31, of 10 Shady Lane, Milford, for possession of Fentanyl and possession of cocaine. Edward Thomas, 45, of 22C Amherst St., Nashua, for unlawful sale of crack cocaine. Michael Vose, 25, of 29 Temple St. #214, Nashua, for two counts of unlawful sale of heroin, second offense and possession of Fentanyl, second offense. Anyone with information on illegal drug activity in Nashua is urged to call the Narcotics Hotline at 603-594-3597.